In the film ‘The Martian’ Matt Damon demonstrates impressively how to survive on Mars. However, might it also be possible to produce textiles there? Many of the technologies required to do so already exist. What might such a scenario look like? And is it in fact so utopian? The two Berlin green fashion fairs, the Green Showroom and the Ethical Fashion Show, are moving to Berlin’s Broadcasting House. In this way, following a successful event last January, the two Berlin trade fairs will reach a further milestone. For the seventh time Redress, the Asian think-tank and non-governmental organisation, which focuses on sustainable design concepts, is calling for contestants for the Eco Chic Design Award. The German machine manufacturer Veit is rigorous in its efforts to ensure that all processes where its machines are involved in textiles production run as eco-efficiently as possible. To offer consumers a complete high-tech experience based on revolutionary production technologies, personalisation in the store and an interactive digital experience is one of Adidas’ primary objectives. With the Futurecraft 3D production process, automatic speed factories and the first performance shoe made using Biosteel® fibres, the sports-article manufacturer is turning its vision into reality by leaps and bounds. The Langbrett brand combines features that belong together: the coolness of a lifestyle in harmony with nature, as cultivated by surfers and skaters with the aim of conserving this nature come what may. Langbrett shows how this does not have to mean abandoning good taste. For the office or the ballroom: Tuschimo, in the Munich district of Schwabing, displays fine ladies’ wear for every occasion on two shop levels and it’s with a clear conscience. Designer Arosha Rosenberger has fulfilled her heart’s desire with her store – and clearly the desires of her growing customer base as well. Jellyfish are normally the kind of creatures that we humans prefer to avoid, because contact with many of them can end up being very painful. You may be familiar with rehydrated jellyfish as a culinary speciality in Japanese cuisine. The Japanese designer Yurii Kasao, however, shows that jellyfish can be processed quite differently to make her '100% Jellyfish Leather'. It is a meeting of giants when SAC and MCL Global issue invitations to their 'Planet Textiles' summit. This is because many of big players in the international textiles industry generally respond to their call. These include Nike, H&M, Levi’s, adidas and IKEA, for example. The summit will be taking place again on 24 May 2017, this time in Bangalore. Positive results at Heimtextil 2017. In terms of sustainability, too. 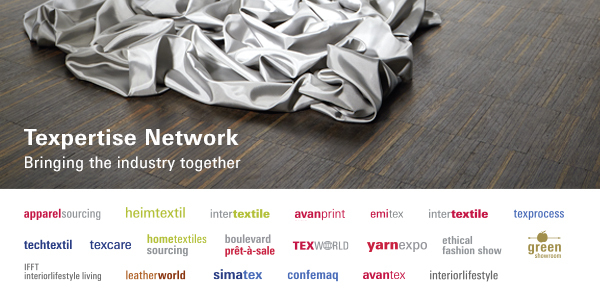 The leading international trade fair for furnishing textiles was characterised by many new formats last January. The echo from exhibitors and visitors was positive. Great interest shown the subject of ecological and social compatibility. At this point we introduce people whose work has been seminal for the eco-fashion industry. Two and a half years ago, Dr. Gerd Müller, the German Minister of Development, launched the Sustainable Textiles Federation in Germany (the German Textile Federation), which currently has over 180 members.